Clinton Russell Robison broke up with the woman who became his intended kidnap victim in March 2016. Text messages and love letters from the next three months, leading up to his arrest in May 2016, show his mental state deteriorating and words turning into action. Robison was intent on “rescuing” the woman from her alleged drug use. On April 2, 2016, Robison and his victim argue about him keeping a key to her home. Robison had recently let himself into her home while she was there and wrestled two phones away from her. Later in the exchange, Robison demands that the victim “get the key” from him in the next hour or he will view it as consent to whatever comes next. 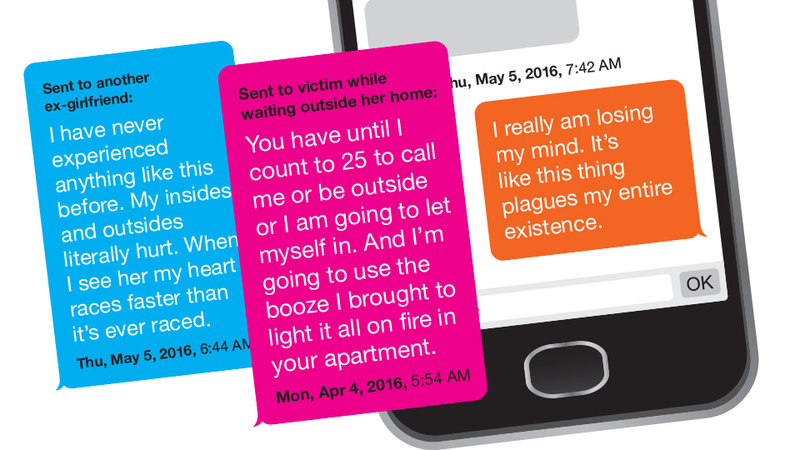 In the next several days, Robison continues to harass the victim, sending as many as 83 messages in the span of 90 minutes. On April 9, Robison claims to have poisoned the local heroin supply, and cautions her against using. “I turned a 1/4 lbs in a 1/2 lbs and now it’s making it’s way through Salem from 4 different routes. Don’t risk it. It’s not worth dying for,” Robison wrote. Robison himself later faced charges of manufacturing and delivering methamphetamine. The following day, in another text to the father, he threatens to put a tracker on the victim’s car. Robison also texted his mother on the same day saying he is going to go out looking for the victim. On May 9, Robison asked another person if he could help acquire methadone, a drug used by heroin addicts while detoxing, and tells him he plans to kidnap his ex-girlfriend. On May 10 and 11, Robison has a long exchange with his cousin, David Elliot Cook, and the two lay out plans for a kidnapping attempt. Robison wanted Cook to be his getaway driver. Cook would later claim he talked Robison down and the pair worked on Cook’s car instead. The messages show Robison asking Cook to purchase black hair dye on his way to Salem, and whether Cook’s girlfriend knows anything about dying hair. Cook eventually plead guilty to charges of conspiracy to commit kidnapping and attempt to commit kidnapping. Also on May 11, Robison asks another man about the availability of space on a large property he owns. He asks specifically if there is a barn or shack on the property. Additionally, he contacts the victim’s father again trying to explain himself. He wrote, “It’s like I have a mental breakdown several times a day sometimes. I have never felt this messed up about anything before.” Robison also mentions kidnapping again later in the exchange. On May 15, in a note to the victim, Robison details driving around the streets of Keizer looking for the victim or her car when he spots it in front of a house that would become the site of his first arrest four days later. Robison wrote he got as far as kneeling down between the victim’s car and a neighbor’s car before deciding to leave. Sometime between May 15 and his arrest on May 19 at the site of the SWAT team serving a search warrant on at the 3555 Cherry Avenue home, Robison appears to have made another attempt to kidnap the victim. He asked a friend and her boyfriend to drive him to the victim’s house. Once they arrived, the woman and her boyfriend told police that Robison hid in the bushes while sending them to the front door. Robison wanted them to get her outside where he could grab her. The woman went to the door and spoke to the victim and told her to call the police. Robison sent one last message admonishing the woman and her boyfriend before being arrested trying to “rescue” his intended kidnap victim at the house on Cherry Avenue Northeast.